A completed and excellent English language course with subtitles in english and with different levels: elementary, low intermediate, upper intermediate, advanced and business. English today is an essential tool in preparing various English examinations and tests required to study and work abroad. The standard lessons are integrated by a special lesson at the end of each DVD. This may be either a video episode with an independent storyline or a cartoon based on typical literature or cinema genres and which explores the language of various expressive forms. Each lesson also contains a workshop section with grammar tables for specific grammar skills . Totally recomended above all if you are learning in your own. In this page I present you this wonderful collection where you can find not only vocabulary, but also listenings, grammar and comprehension in a funny and interactive way. It is a good method for you or your students. As you see in this collection you will find books from elementary to high levels. Below , you’ll find all the books with the index page of each. Just click and go. Be patient because it needs a few seconds to charge. Then, the cover will appear. Again click and enjoy!!! Don’t miss it !!! Have a look!!! It is really great!!! One of the aims in our classes is teach our children all about numbers. In this page you will found many games related with numbers. 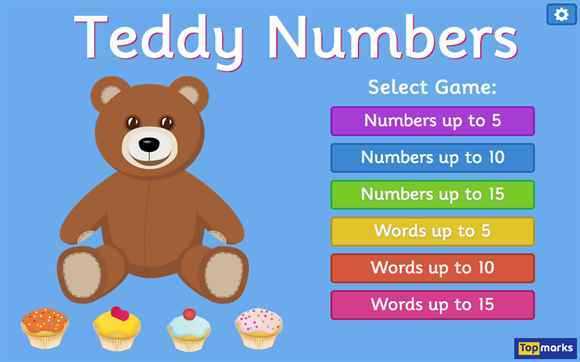 The Teddy Numbers game can help children to learn numbers to 15.